injury, Kevin even got to sit in the cockpit. Kevin tells me this one was taking just before he lit her up. He really knows how to rub my nose in it. 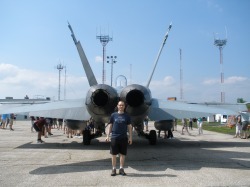 This is what I like about living/flying in Canada-this guy flies his F-18 into an uncontrolled, middle -of-nowhere (sorry Wiartonians but you are) airport, lets the local enthusiasts check it out up close and probably parked it there over night without a security detail. Tell me that's going to happen at an American airport-I couldn't even snap off a few photos of some 30 year old jet fighters the last time I passed an American airbase. I guess nobody told him he's parked in my spot. 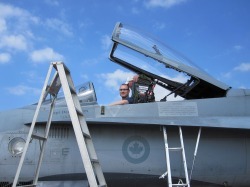 I'm not sure if my nickname was "shitter" that I'd be proudly announcing that on the side of my jet fighter but then I guess no one is really going to make fun of someone with access to Canada's preferred attack jet.